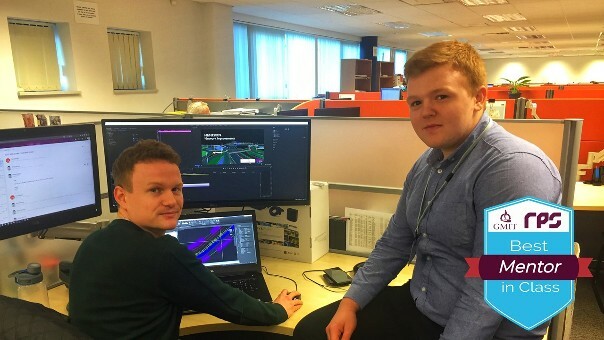 GMIT Building & Civil Engineering student Conor McLoughlin (right) from Swinford, Co Mayo, winner of the digital badge, pictured with GMIT Engineering graduate Paul O’Leary in the RPS offices, Mervue. A lecturer in the Department of Building & Civil Engineering, Wayne Gibbons, has developed a Digital Badge in association with RPS, a multinational engineering consultancy firm, which recognises and rewards students who demonstrate outstanding communications and mentoring talent as well as technical proficiency in civil engineering software. Mr Gibbons, who developed the Digital badge as part of his doctorate studies, says the innovative micro credential award complements the formal degree qualifications and verifies for employers that a range of skills have been acquired by the graduate. The Dept of Building & Civil Engineering has developed a suite of digital badges for a first-year module pilot study. The “Best Mentor in Class” digital badge is unique in that it is presented to only one first year student each year. The student is chosen by their fellow classmates, through peer (student) nominations, as well as in consideration of high technical proficiency using the design software. This year’s digital badge was awarded to Civil Engineering student Conor McLoughlin from Swinford, Co Mayo earlier this week. In addition to the Digital Badge, Conor also won a day to attend the RPS office in Galway. The Dept of Building & Civil Engineering has well-established links with RPS through student and staff collaborations on research & innovation projects and initiatives. Mr Gibbons says the digital badge offers great value for employers in the recruitment of college graduates. “It recognises a set of important skills and traits, in addition to their formal degree awards”. Mark Costello, Director BIM & Technical Services, RPS, met with Wayne over two years ago to outline the type of characteristics RPS values in Engineering and Architectural Technology graduates, helping design the badge and offered to give the winner, Conor, a full day in their Galway office to see first-hand the practical skills necessary to deliver large infrastructural and building projects in new collaborative design and 3D working environments. RPS is a leading international multidisciplinary consultancy supporting clients through the development process from planning to design to implementation. They have over 5,500 employees located in 66 cities and major towns around Ireland, the UK, the Netherlands, USA, Australia and South-East Asia.